It can be really challenging getting the kids to line up for a posed shot. I wanted to get the boys to jump off from the totem together. 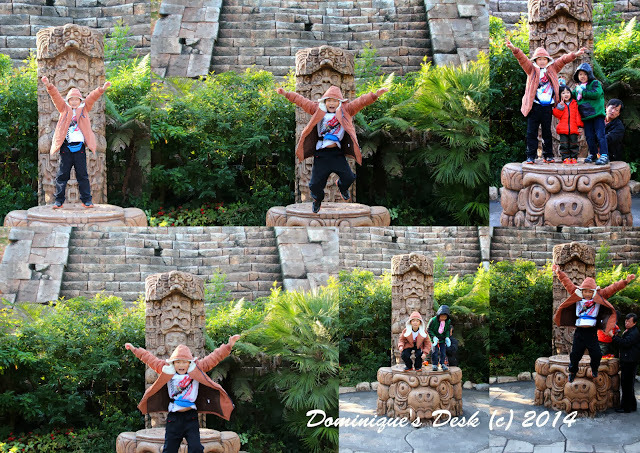 As you can see from the above collage I only managed to get Monkey boy to jump on cue. I guess with more then one person jumping it can be quite difficult to co-ordinate. I gave up trying to catch the “perfect shot” as Tiger girl wanted in with the boys having so much fun jumping around. She too wanted to jump off from the totem which really scared me as it was really rather high for her height. I had to hold both her hands to make sure she landed safely after jumping. Do your kids love jumping too? My kids don’t cooperate, either. Looks like lots of fun. Sometimes we have our girls hold hands for the jump if we want to get them at the same time. How Cool, I like what you have done with the pictures, it gives it a good effect and feeling. And involving physical activities for al with the kids is always a plus. My little one LOVES bouncing…I’m not sure if it’s jumping quite yet. lol! She’s 11 months old. They used to when they were younger. Now, they would rather head to the mall. Cute! My kids love jumping, also. It’s hard getting them all to coordinate jumping or anything in a photo. My boys used to scare me with how high the wanted to jump off things. You kids are so cute. My youngest is always bouncing. My girls like jumping off things too. Great photos. I think they are pretty perfect. I like shots capturing the jumping action. Great shots you had. I think all kids love jumping! Great shots! Where are you? It looks beautiful. Agree with comment above – all kids love to jump. we were at Tokyo Disneysea. The kids and I visited the place during our holidays last December. You did a great job! I can’t even get my two to cooperate with me for a normal shot, much less a jump shot. You did get some great, fun pictures here! Oh, yeah! Thats looks like fun! Thanks 4 hosting this project.